4K streaming is the ability to watch online content that has a resolution of 4,000 pixels. Streaming 4K content requires both a 4K streaming device that has twice the horizontal and vertical resolution of 1080p, and a fast Internet connection to handle the extra bandwidth. With roughly four times the pixels of 1080p, 4K streaming provides a richer viewing experience, showing you individual blades of grass as they shift in the wind, or the scattering of particles as characters move around. With 4K streaming, you feel more like you’re part of the experience rather than a passive observer. But all those extra pixels also require some extra bandwidth. In addition to having a fast, reliable Internet connection, you generally want to have 15–20 Mbps of spare bandwidth for your 4K streaming device. Yes, you read “spare bandwidth” correctly. Think of it like having some extra space or breathing room at a party for unexpected guests. The spare bandwidth lets you continue streaming your 4K content uninterrupted while your housemates are gaming or streaming their own content. Along with a fast, reliable Internet connection and some spare bandwidth, to get the most out of 4K TV streaming, you need either a 4K-compatible smart TV, or a 4K TV and a streaming device. What’s the difference? Good question. The simple answer is the way you connect to the Internet. Smart TVs are designed to connect directly to the Internet, and often have a TV streaming service like Netflix pre-installed or available to download. 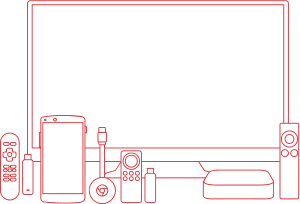 This means you don’t need a separate streaming device—like a gaming console—to watch Netflix. Many big names like Samsung, VIZIO, LG and Sony, make 4K TVs and smart TVs, as do other manufactures like JVC, Hisense, Sharp, Hitachi and Panasonic. If your TV is 4K-compatible but isn’t “smart,” then you need a streaming device that connects to the Internet and has the ability to stream 4K content. When picking a 4K TV streaming device, consider your budget, streaming preferences, and whether or not you’re going to be using it for anything else—like gaming. Many popular gaming consoles, such as the PlayStation 4 Pro, Xbox One S, and NVIDIA SHIELD are built for 4K content. One thing to keep in mind is that streaming service access may vary, as may setup. Accessing Amazon Instant Video from Chromecast, for example, requires some additional steps beyond just logging in with your Amazon credentials. So if you prefer Amazon 4K streaming for TV shows and movies, the Amazon Fire TV or Roku 4 might be a better choice. Whether you’re a gamer or just want to stream 4K content, learn more about available streaming devices. With 15–20 Mbps of spare bandwidth, a smart TV with 4K technology, and a streaming device, you’re almost ready to start enjoying 4K video streaming and TV shows! All that’s left is finding 4K content to stream. The number of titles available in 4K may vary by service. For example, users have been uploading 4K content to YouTube since 2010, and while it’s free to watch since the videos are supported by ads, they are generally video clips instead of feature-length movies. Don’t want to bother with smart TVs or streaming devices? That’s OK. 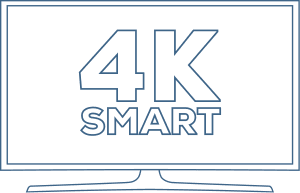 There are TV services that also offer 4K content. If you subscribe to DISH® TV, for example, you can access on-demand 4K content. Frontier has the speeds you need for streaming 4K content, so call today.